MARK GOLDMAN received a B.A. from Rutgers College and a J.D. from Rutgers Law School in 1973 and is licensed to practice in New Jersey, U.S. District Court of New Jersey and the Southern and Eastern Districts of New York. 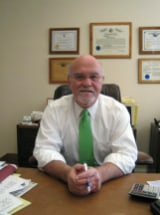 He was a senior partner in the East Orange/Jersey City Law firm of Tulipan, Goldman and Conk from 1984 to 1992. He resigned from the firm of Tulipan, Goldman and Conk to form the firm of Mark Goldman, A Professional Corporation. Offices are maintained in East Orange, West Orange, Jersey City and Paterson. The firm's practice is concentrated in the areas of consumer bankruptcy law and real estate law. Prior to entering into private practice, he was the senior supervising consumer staff attorney with Essex-Newark Legal Services from 1973 to 1979. He was a three year member of the Lawyer's Advisory Committee to the United States Bankruptcy Court for the District of New Jersey and was member of the Advisory Committee on Chapter 13 Practice in the United States Bankruptcy Court for New Jersey. He is a past member of Essex County Bar Association Executive Committee, Creditor-Debtor Section; a member of the National Association of Consumer Bankruptcy Attorneys; a member of the American Bankruptcy Institute and a member of The National Association of Consumer Advocates. He has lectured on bankruptcy matters for the Institute for Continuing Legal Education and Professional Education Systems, Inc. He was selected as mentor in the Honorable Daniel J. Moore Bankruptcy Inn of Court Program. He has co-authored a section of a book "Bankruptcy Practical Skills Series" for the Institute of Continuing Legal Education. In addition Mr. Goldman co-authored, Inside the Minds, Chapter 7 Consumer Bankruptcy Strategies, Aspatore Books, 2010. He has been selected on numerous occasions as a panelist for the New Jersey State Bar Association Bankruptcy Law Bench Bar Conference. He is also a past member of the Supreme Court of New Jersey District Fee Arbitration Committee and former Chair of Suburban Essex District V-B Fee Committee. He has also been frequently interviewed and quoted in the New Jersey Law Journal and various newspapers concerning bankruptcy issues. He has represented consumers and small businesses with compassion and understanding for over 44 years. Lecturer on Bankruptcy, for the New Jersey, Institute of Continuing Legal Education & Professional Education Systems, Inc.